Hi everyone! I can’t believe it’s been almost a month since my last blog post. But I have been very busy on a special secret project I’ll share very soon. I’m SO excited about it! So what have I been up to? I know that has been at the top of everyone’s mind (ya right). 😉 I finished a Villa Rosa quilt top from a kit that I picked up at the Cedar Chest Quilt Shop in El Campo, Texas (SAH-LOOT!!) — a little HeeHaw humor for you U.S. readers of a certain age 🙂 — It was a stop on the Taste of Texas Shop Hop I did in Feb with one of my junior high besties, Lee Ann. It’s in the queue to go on my longarm. Have ya’ll heard of Wendi Gratz from Shiny Happy World? She was a children’s book writer in a former life and now designs quilts. She has a Craftsy class for Woodland Friends that I’m enrolled in and I’ve made a total of um…one block. BUT THEN… She came out with this absolutely adorable Dinosaurs pattern and I had to have it! I purchased the Dots fat quarters and the pattern at the same time. Look how she includes a Thank You note in every order and she signs it!! On top of that, you get a coupon code for a future purchase. Sweet! Really, how stinkin’ cute is this quilt? It’s a quilt-as-you-go and she has a ton of videos on YouTube on how to make it all. Unfortunately, she was out of the dinosaur skeleton sashing and the batiks for the earth and sky. So sad… Not really! 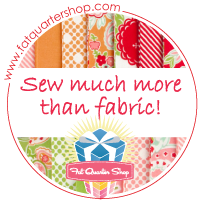 That means a trip to my favorite local quilt shop, The Scrappy Quilter. Seriously, I’m in there so much I should have my own parking spot (hint, hint!) Look at my haul! I picked up three blues, three greens and I can’t wait to stitch up that pretty grassy batik. Wendi uses a lot of the Burlap Brights from Benartex in her quilts for the trees, leaves, and whatnot and Scrappy had a roll of 2.5″ strips with my name on it. I really didn’t find it but one of the sweet ladies who works there did. On my last trip to Scrappy, I had earned (another) $25 gift card for them so…why not? I had this dark gray grunge print in my stash I’ll use for the sashing and I’m thinking the backing will be either a gray or deep blue minky. I can’t wait to get started! She recommends printing the applique pieces on pre-cut printable iron-on fusible web. Well, I don’t have any that’s pre-sized for the printer however I do have a bunch of Wonder Under on the bolt. So what’s a girl to do? Why cut out 8.5″x11″ pieces from the bolt of course! I got a total of 8 “pages” of printable iron-on from my bolt with 4″ leftover pieces from each cut. So being ever-practical as I am, I took those leftover 4″ pieces and taped two of them to a piece of printer paper and ran it through the old HP. And viola! Four more pages! I still need more so there’s another trip to WalMart. On another front – I follow a blogger called GoodByeValentino. Her name is Sarah and she used to buy very expensive RTW (ready to wear) and decided to begin buying designer fabrics to sew them herself. Her blog says she’s saved thousands. Ohhh kay? ?…Obviously, she and I don’t shop in the same locales. ha ha Thanks to China, and Kohls, I still can buy cheaper than I can make it most of the time. But I love her concept. Well Ms. Sarah put a book out called The Tunic Bible and I’ve always been intrigued because who doesn’t want to sew a top that covers the backside, amiright? One day I was surfing on FabricMartFabrics.com and you wouldn’t believe it, but I got 4.8 yards of an amazing knit navy blue paisley print for under $5…more than FOUR yards! That stuff just screamed Tunic! So I bought the fabric, and headed on over to Amazon to buy the book. I have enough fabric for a muslin and the final garment. Nice. One of her posts was for an out of print Vogue pattern #9047. I love this dress! I looked on Etsy and I found it from LanetzLiving and it was just $6 with free shipping. The pattern arrived within a week and the vendor sent along a signed invoice a free little flip flop charm! Cute! Don’t you love freebies! This will go on a necklace I wear at the coast. I will definitely order from her again. Back to quilting – Missouri Star Quilt Co had a Daily Deal (that’s how I built/build my stash for pennies on the dollar), and the other day they had a 10″ square pack of the Heritage line and while I didn’t sign up for the deal, I did pick up the coordinating panel, backing, binding, and the Placemats kit. Two more projects are now in the queue for a patriotic wall hanging and placemats. Perfect for The 4th of July! So that’s it! Actually, that’s quite enough for now. Don’t these people know I’m away from my sewing machines for 10 hours a day while I’m at “work”?